I’m sure we have heard the term, its “Nothing Personal,” especially those who have seen the Godfather movies. This phrase is also the name of this week’s guild. The guild, Nothing Personal, is very competitive and PVP focused…they take PVP serious. Nothing Personal loves to dominate and win ranked PVP matches, but they take a loss in stride and enjoy SWTOR for what it is…a game. So like their name, whether they are beating you down or taking a loss, it’s Nothing Personal. How did the guild get started? Is this the first game for the Nothing Personal Guild? What server and faction are associated with the guild? We’re now an Imperial guild mainly on The Bastion that started on the Swift Sure. The guild was originally an Operations and casual PVP guild. A few of the dedicated PVP’ers, including myself, wanted it to be more PVP focused and considered leaving. However, we all got along so well and there was a lot of talent so we weren’t in any hurry. Eventually the old GM left the guild and passed on lead to me and another of the more PVP focused players. He has since moved onto MVP and I’m now GM of NP. This is the first game that most of us have guilded up in together. Some of these guys have brought friends from former WoW guilds and Warhammer online but as a group, this is the first. We used to be Vindicated but with the PVP overhaul that came shortly after Swift Sure got merged into the Bastion, we figured with a new agenda should be a new name. Does Nothing Personal take PVP serious in SWTOR? How does the guild define being serious in PVP? I like Nothing Personal because we take it seriously… but not too seriously. We also strive to keeps things drama free, and focus on enjoying the game. As competitive as some of us are, at the end of the day it’s still a game. Ranked PVP is still fun for us because we enjoy competition in itself. What’s great is even if we’re having an off night, our focus is off, communication is bad, and we don’t let it get to us. We still manage to enjoy it through the frustrations that come with competitive PVP. What warzones are favorites of the guild? What is your personal favorite class/advance class to play in PVP? I think we all have our own favorites, but nearly all of us love some Huttball. As far as the other maps it’s personal preference more than guild preference. I think Voidstar is a great map but a lot of the guildies can’t stand it. And if there was an overall least favorite map I think it would be safe to say that it’s Hypergate. And I think that’s more of a PVP’ers least favorite and not just us…seems to be the general consensus. As far as classes, most of us are altoholics. With the 20 or so in our core group, there are over 100 characters in guild. Almost all of us have one of each advanced class, which not only breaks the repetition, but helps us understand how to properly counter other classes. Do you find it hard for a PVP focused guild to balance the other aspects of the game? How does this MMO measure as far as allowing players to play or level they prefer? How do you think can be improved? I think being a PVP’er mainly, I mean… most of my toons only have one companion, my jug didn’t get a ship until level 47 and that was only because I needed to run dailies. That’s how little I PVE or level through class missions. Anyways, of course some players, like me, want to PVP and only that. We don’t want to run dailies, we don’t want to craft, we don’t want to run operations for a hilt so we can be BIS in PVP… but we’re forced to. But we do these things because there isn’t a choice… we have to PVE so we can PVP. It’s not ideal but it’s the nature of the beast. Personally, I’d like to see greater rewards offered for PVP. With the dailies and weeklies we have now. A casual PVP’er can finish those no problem. Those are designed around a casual player base. But for those of us who spend our time doing nothing but war zones, I think some REAL PVP dailies and weeklies or even missions of some kind would be nice. Winning 9 war zones sounds more like a daily than a weekly to most of us. I would love to see a weekly that required 25 wins over a week and have it give some real rewards. At least enough rewards to keep us from needing to grind through Ilum or Makeb, as often as we’re forced to, just to keep our credits up. Do you find that people put PVP guilds in a certain stereotype, like being consider “elitist” etc.? Definitely, but in many cases it’s deserved. But it’s good to see guys like Justbodies and Scold who are some of the best on the server and possibly in game, who are just good people who enjoy competition. They are the exception to the rule though. If I had to run the numbers I’d say there are far more that deserve the stereotype than those who don’t. Do you feel being focused on ranked PVP, should be considered just as important endgame progression? How can the MMO genre improve on these two endgame playstyles being on more equal footing? Of course as a PVP’er… yes, but at the end of the day I get it… the Los Angeles Cantina Tour was an awakening experience. Money makes the world go around and that includes this MMO world. It sounds like BW is extremely limited to what they can do by EA. They’re given a budget and have to profit from it. From a business perspective it makes sense to spread that budget a little thicker on the PVE aspect of the game. Especially considering the money spent on the voice actors and PVE content. I doubt they want to think about how many of us PVP’ers space bar right through the millions of dollars spent on voice acting. I believe PVP’ers will be around for a long time if you give them a reason. Right now, I don’t think they’re giving us enough, especially with games like Wildstar and ESO (Elder Scrolls Online) on the horizon. Jeff and Eric were very confident that 2.4 would give PVP’ers enough. More than enough even. Talk of “ranked areas” (this could have been a hint at arenas), I took it as more of an open world experience. More events coming that give us our fix of open world PVP, of course with the hero engine they made it very clear that it’s unlikely that open world would ever be large scale. And I may be digging deep and hearing what I want to hear since they were very vague but I think it’s safe to say that season one of ranked is finally here. Apparently pre-season in space is much longer than pre-seasons on earth. In the end, I think EA needs to understand how important the PVP community really is. And if given the content and attention, we will be here years from now. In my opinion this game had the potential to be the WoW killer. Even with its flaws it’s still second to the most profitable MMO on the market. With the engine, marketing mistakes and trying to please the most difficult types of people on the planet (MMO players and Star Wars fans), it put them in a tough spot. Not to say that this game doesn’t have long term potential. It does… but I think they under estimate the value of PVP content and what it could bring to the game if they put more focus into it. Even with all of its bugs, exploits, problems and class balance issues in the past and current, this is by far the most enjoyable PVP experience I’ve had in an MMO and they could definitely capitalize on it. Okay, Bolster has issues, but how do you think from your guild’s perspective these issues should be resolved? That’s something that only the devs can answer because I’m sure it’s a long technical answer with a ton of code. At the same time…. It needs to be focused on and given higher priority. The crafted 54 bolster bug could literally ruin competitive PVP. Luckily on Bastion we have a pretty good PVP population that doesn’t exploit, we don’t /stuck nor exploit bolster. But all it would take is one team to fully exploit it and we’d all be forced to. I just really hope bolster is given more attention and bugs like this don’t go unfixed as long as this one has. It’s been made very clear that bolster is here to stay and it serves a purpose. No matter how many people complain… bolster will not be removed from 55’s or any bracket. It was one of the first things stated very loud and clear at the Cantina Tour in LA. I mean, I don’t see the purpose of it at max level, but then again I’m wearing PVP gear and I know at the end of the day they need to keep all players happy. Which means making that guild that just finished NM TFB happy by not making them too powerful, but at least playable in max level PVP. I get it… I don’t like it… but I get it. Can you tell us about getting to talk with Jeff Hickman and where this was at? Having spoken with Jeff Hickman, do you feel BioWare is making an effort to “fix” PVP? Honestly, it was a kind of last minute thing that we joked about going to, until a guildie said he could get me into E3 the same day and then we could hit the Cantina Tour afterword. It was at the Los Angeles Cantina Tour at Cana Rum Bar downtown. Literally,…literally a block and a half away from where E3 is held. It was a lot better than I expected, and I’m not just saying that because of the open bar. All of these guys were very cool people and you could tell they wanted to talk about the game with the players. I caught Jeff’s attention by mentioning open world PVP and a Warhammer style approach. Being the LD on that game as well, he perked up and said I should talk to him after the Q&A. I got to talk with him for quite a while, spent a fair bit of time talking to Eric as well. After talking to both of them I’m really more optimistic about PVP and the future of it. It sounds like these guys are paying more attention than most would think and both hinted at having toons on Bastion and knowing who we were and a lot of the top tier PVP guilds and players. It was reassuring to see how much these guys really do care about PVP in this game and to hear it in a much less professional approach than what we’re given on the forums… well, it somewhat restored my faith in the future of SWTOR PVP. Really, it’s not so much change we need. Its content, we don’t need different… we need more. We need more maps, it’s that simple. Especially with the lack of open world PVP, new war zones are a must. As hard as it is to wait till possibly the 2.4 update, for fix on this does Nothing Personal prefer waiting, and it be right or have it quicker and not quite address all the issues? I think at this point with all the problems that have come with each patch that we would rather wait and have it done right. On that same note, there is a lot of potential competition popping up on the MMO market and as much as most of us love this game. I think we’re all keeping our eyes open for the next big MMO. As much as we would love to stay with SWTOR, I think our frustrations have us keeping our options open. Does you guild participate in any Open World PVP events? If BioWare would come up with a “playable” way of having real Open World PVP what would be Nothing Personal’s opinion? We do… maybe not always in the most productive of ways but we enjoy it nonetheless. We love the Gree event and we’re glad it’s going to keep recurring. Most of the time we are doing dailies it turns into us shutting down the nodes for quite a while. Because we’re experienced PVP’ers and most of the players out there aren’t. I have to admit… its pretty damn fun for 4 of us to shut out group after group and sometimes multiple groups in a row. The most productive thing we’ve been involved with was Scold’s dueling tournament. Everyone pretty much knew who would win it, he knocked me out in the second round, but in the end it’s good for the community and PVP. On that same note though, at the Cantina Tour open world was definitely talked about. It’s something they definitely have plans on implementing more of but because of the limitations of the hero engine they’re forced to keep it small scale. I don’t think we’ll see anything like the old Ilum days again and for good reason. The engine just can’t handle it. Also, speaking of events, keep those DNA samples handy, there is another world event coming soon and those things haven’t been sitting in your cargo for nothing. If Open World PVP is not a real option for the near future, would the guild like to see more on an arena style of gameplay be added, like 4 vs. 4 for example? A lot of the guild would love to see arenas. I know players from games like WoW have said that arena type PVP can hurt PVP and create more balance gripes with players but my perspective is that more content is a good thing. As long as they don’t focus around it or balance around it over war zone style PVP. Along with any future fixes to PVP, do you think SWTOR needs to have some sort in-game or web based scoreboard to highlight players and guilds that are winning in PVP? I would love to see this… especially since the only real reward for ranked PVP is bragging rights. It should be in bright lights on the fleet so bragging rights can’t be disputed but in writing, clear as day for everyone to see. If someone is looking to join a PVP focused guild, is the Nothing Personal guild currently recruiting? If so what steps does a potential recruit need to take to apply or contact the guild? I wouldn’t say recruiting, we’re dealing with getting focus and coordination together with the large number of new players we have now. It takes some time to get used to rated PVP. A decent player can go into regs and demolish people all day because of the lack of strong PVP’ers in this game. Most think they can bring that same play style to rated but it doesn’t work that way. One second or one mistake can make or break a game, it really takes a lot of coordination and team work. So back to the question, not so much recruiting but we’re always looking for talent. We try to keep things relatively small and keep our core group tight. As of now we have 22 active accounts I believe and 2-3 of them are trials who may or may not be in the guild two weeks from now. However, we pretty much are willing to group up with anyone to see if they have enough understanding of their class and the game to compete at the rated level. We’re only taking experienced rated players or ones that have exceptional skill. We’re one of the few PVP guilds with a website, so head over and check out our site. In-game, we can always be found on fleet in the combat training area. There is an officer on at nearly any time of day. They can also contact me in game at Uglymr-j via mail or whisper. Thanks to Uglymr-j for all his help with this week’s article and also thanks to the members of the Nothing Personal guild. I wish you all the very best and here is hoping for some great PVP content in Update 2.4. If you are looking for a guild to possibly run with in some ranked PVP, matches or just would like to know more about Nothing Personal, I would suggest going to their website or contacting Uglymr-j in-game. How exactly can you have your guild highlighted on Community Checkpoint? All you need to do is submit your guild/group’s website and some basic information, like Nothing Personal, in an email to me at, jason@corellianrun.com. 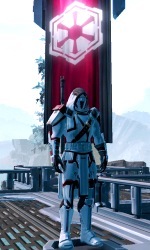 At Corellian Run Radio, we love to highlight members in the SWTOR community, from guilds to the many people working to plan events, contest, etc. We look forward to hearing from you! Thanks and see you next week!